On opening day ten years ago, I was standing on the bridge over the Stellako River near the lodge. Several varieties of stoneflies, caddis and mayflies filled the air, and trout were picking off those that spent too long on the water. The hot July sunshine was slowly cooking my neoprene waders and a bulging fly vest didn't add to my comfort. But, I was happy and content. I had finished an incredible morning's fishing and was now just watching the other anglers casting to rising trout. A beautiful young woman approached me and inquired about the fishing. I truthfully replied it was so good that I didn't need to catch another trout. She looked skeptical, so to demonstrate I walked beneath the bridge and made only two casts before a foot long rainbow was dancing at the end of my line. The Stellako River can be just as good today, but it may also appear devoid of fish. The season, the time of day and the weather are the deciding factors. An example was later in the day after my remarkable morning action. A cold front blew in and the blustery weather ended all activity. The following day was totally dead except for one magical hour in the afternoon when the wind stopped and the sun came out. A few big golden stoneflies started laying their eggs and trout were there to greet them. I caught a couple of 14 inch rainbows before spotting a large trout feeding selectively on the adult stoneflies. 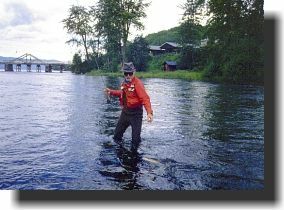 The trout had obviously experienced some unpleasant experience with an angler because it would only take insects that fluttered on the surface. The rainbow would rise to within an inch of a live stonefly drifting in the current, but would only take if the insect kicked or struggled. My deer hair imitation was ignored after a few cursory inspections. I worked on that one fish for the better part of an hour. And, when I finally hooked it the rise was pretty well over for the day. The solution to getting the trout to strike was a tactic I learned while experimenting with fan-wing dryfly imitations. Fan-wing patterns have a tendency to twist light leaders. After landing on the water and being brought under tension, a twisted leader will try to straighten, causing the fly to spin and flutter on the surface. My spinning fan-wing completely duped the 22 inch Stellako rainbow and it confidently slurped it down. There are many trout this size in the river during the spring insect hatches and the fall sockeye run. During the heat of summer most of the larger trout return to Fraser Lake. The average resident Stellako rainbow is from 12 to 16 inches. Besides rainbows there are numerous whitefish and a few huge suckers. Anglers are often disappointed to discover the big trout they think they've hooked on a dead drifted nymph is actually a sucker. The Stellako River is a free stone stream where the gravel bottom isn't too slippery for felt soled waders. 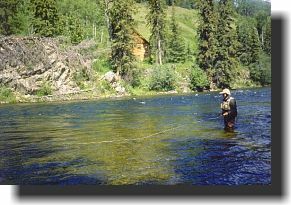 The first quarter mile below Francois Lake is a superb piece of flat pocket water where trout lay close to the bank under brush and out in the middle in rocky depressions. Downstream from the flats the valley narrows and the river picks up speed, forming a series of runs, pools and rapids. The river can be drifted by experienced rafters. A few miles downstream the river is constricted into a rapid that can be tricky and dangerous for most boats. It is possible to walk a raft around this difficult stretch. Below the rapid is what is known as the Millionaire's Pool. After the Stellako leaves the narrow valley the current slows down and becomes almost placid by the time it reaches the highway 16 crossing. This lower section is on native indian land and is off limits for anglers. 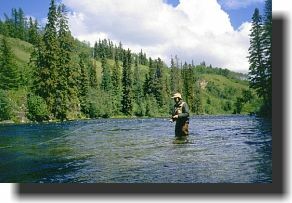 The Stellako River is only about seven miles long and the best of the fishing water has been purchased by the Nature Conservatory. It has special fishing regulations including catch and release, gear restrictions and a special licence. A rough trail follows the south bank downstream from the bridge at Francois Lake. 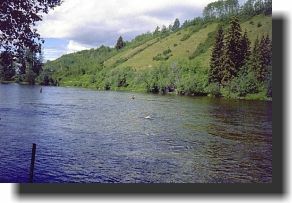 There is very little access on the lower river except through private property and a couple of steep un-marked trails. The road down through the gravel pit to the lower river has a steel gate and it is often locked. The Stellako Lodge at the outlet of Francois Lake has superb dining and offers several cabins for rent. They are usually occupied during the high season and reservations are necessary. There are a couple of free Forestry campsites across Francois Lake. The fishing season starts June 1st and ends November 14. The best insect hatches are from mid June to mid July. Trout will almost always rise during a big golden stonefly hatch. These insects require a long shank size 6 hook. The Lime Sally is a very important slender little stonefly matched with a size 14 hook. The colour is a bright chartreuse green. Trout can be very selective to them and refuse anything but a drag free drift. Casts don't have to be long, but they must be accurate and with good line control. This is also important during a mayfly hatch. Most of the mayflies are size 14 and smaller and come in shades of tan and grey. Only the larger mayflies bring the big trout to the surface. 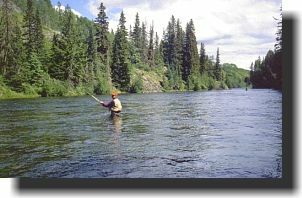 In September, sockeye salmon arrive and large trout follow them up from Fraser Lake. Smaller trout from Francois Lake also move downstream for the feast. During the sockeye spawning a weighted egg pattern is the only fly needed to catch rainbows and whitefish. 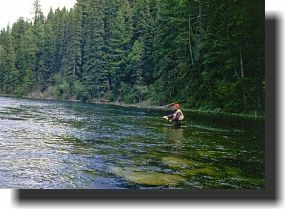 The Stellako River is one of the premier trout streams in British Columbia. It is located just south of Fraser Lake, about a two hour drive west of Prince George . The river is popular and you are seldom alone, but it's easy to find a spot to yourself.